A traditional house that has been carefully restored is always a pleasure to find and thus it was with delight that we wandered through the welcoming rooms of this charming rural retreat. The interior is a perfect blend of old and new. Traditional carved furniture of heavy wood sits atop terracotta tiles in the cosy sitting room, a pretty kitchen, curtained with colourful fabrics is adorned with local pottery, whilst in the immaculate bathrooms thoughtfully chosen ceramics decorate tap handles and walls alike. Standing high on the slopes of a south-facing hillside, on the edge of the local village of Solana de Utiaca, this privileged situation combines a picturesque panorama of mountains with proximity to amenities. Built in 1850 and carefully refurbished in 2001, the stone, terracotta and wood building has a floor area of 200 m² with modern facilities in a charming atmosphere. There is WiFi for our guests traveling with laptops or iPads.This villa has a private pool (6,5 x 4 mt) with a panoramic view to the mountainous landscape.From the house, a narrow footpath winds its way up to the parking area and the village above of Solana de Utiaca. Within walking distance, this small village has a grocery store, although for a greater selection of amenities Santa Brígida and the market town of Vega de San Mateo is a 15-minute drive.The city of Las Palmas and so the coastline is only at 20km. Within 30 minutes drive, a great variety of beaches can be reached, all of them away from mass tourism. Melenara, Las Canteras or San Andrés give you the opportunity to spend the day in the beach in a family mood with the local people. Then, with the sunset, you may enjoy a dinner of fresh fish at any of the inexpensive restaurants around the area. The Real Club de Golf the Las Palmas is within 15-minute drive of the villa next to the stunning Caldera de Bandama, a 200-meter-deep volcanic crater, on whose peak you will find an observation platform that affords you a scenic vista of the island. Kill two birds with one stone!Other Activities: Contemplation of volcanic geography, visiting archaeological and ethnographic sites, hiking. Renseigner vous sur le service de nettoyage quotidien. Maison pleine de charme où nous avons passé un séjour super agréable dans une nature très impressionnante. Super piscine et calme absolu, proximité des commerces. Point de départ idéal pour les plus belles randonnées de Gran Canaria. Bien que l'accès à la maison soit difficile, nous avons apprécié l'aide reçue pour les bagages. Nous y reviendrons très prochainement ! The house is very comfortable with 3 bedrooms and bathrooms. The cleaning is perfectly done (once a week for the house and twice a week for the garden and the pool). Beatriz is a "top" host, always available and nice. We booked this villa for a family holiday with 6 adults/grown-up kids. Arriving at the villa is a bit of a challenge in a car but we kindly had the help of someone with their own (slightly battered!) car to help us down. The view is amazing as per the photos as you are really on the side of a mountain! The pool is lovely but v cold! The outside BBQ got a lot of use and we used the kitchen a lot to cook - it was on the smaller side but well equipped. The host was helpful despite her broken leg! We didn't really need to contact her as everything was pretty self explanatory. There are some restaurants within a 20 min walk (up steep hills!) but seemed very random what times/days they opened! Nice, non-touristy place of Gran Canaria, authentic food. Wouldn't say this is a luxury villa by any means, more rustic but very clean and everything you need. Had to buy things like toilet roll, bin bags, dishwasher tablets, sponges etc- we were there for 10 days but would've been nice to have been fully stocked to last us. A very nice and clean family house with everything you need including a private pool. 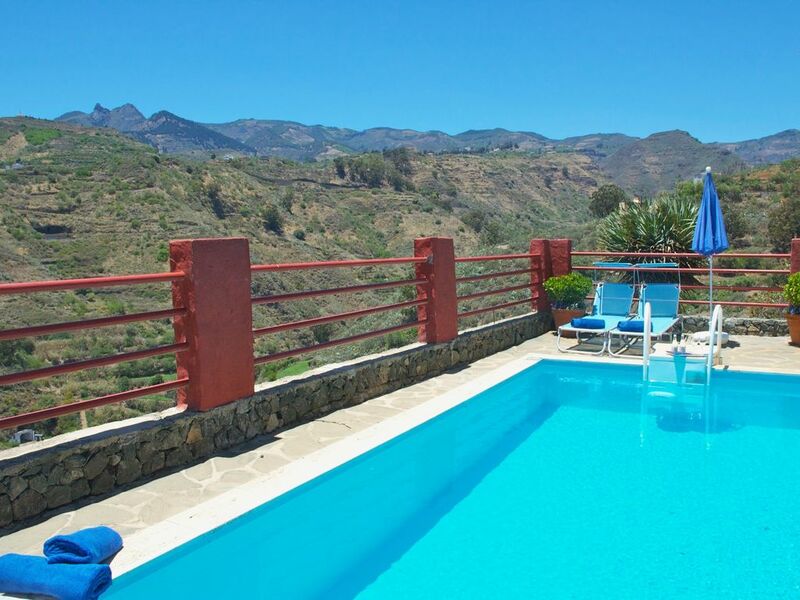 Well situated in the mountains at 25 kilometres from Las Palmas. Iballa, the friendly owner, had already done some initial shopping and was very helpful by bringing the luggage to the car (the access to the house is not very easy by car). We really enjoyed our stay at La Casa del Moral! A lovely house in beautiful surroundings with a really helpful and nice owner! The views from the house and poolarea are spectacular, we can highly recommend it! De la maison, un sentier étroit mène jusqu'au parking et au village au-dessus de Solana de Utiaca. Tout près à pied, ce petit village compte une épicerie. Pour plus de choix, Santa Brígida et le marché de la ville de Vega de San Mateo sont à 15 min en voiture. La ville de Las Palmas et le littoral ne sont qu’à 20 km. A 30 minutes de route, vous trouverez une grande variété de plages, loin du tourisme de masse. Melenara, Las Canteras ou San Andrés sont une occasion de passer une journée à la plage dans une ambiance familiale avec les personnes du coin. Puis, avec le coucher du soleil, savourez un d��ner de poissons frais dans les restaurants peu coûteux du coin. Le Real Club de Golf Las Palmas est à moins de 15 minutes de la villa à côté de la renversante Caldera de Bandama, un cratère volcanique de 200 mètres de profondeur, avec une plateforme d'observation qui vous fournira une vue scénique de l'île. Faîtes d'une pierre 2 coups!